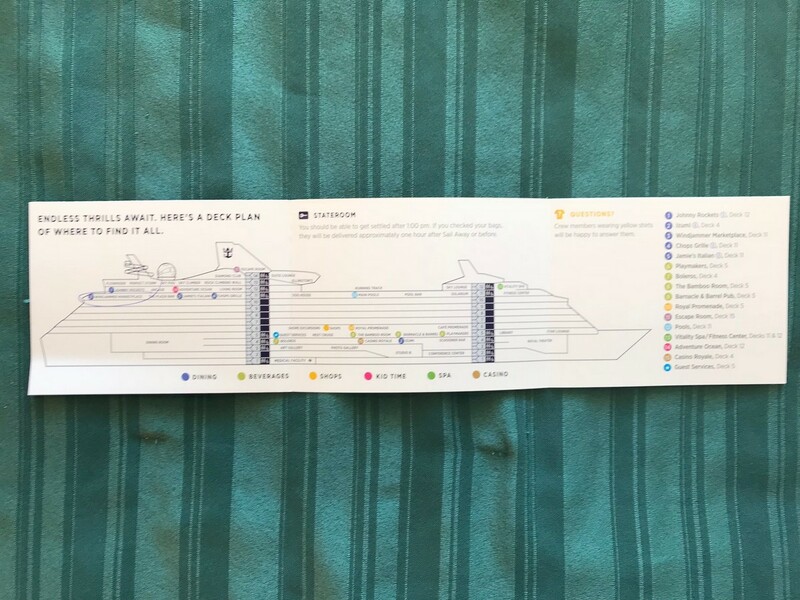 Embarkation day on any Royal Caribbean cruise is an exciting and busy day, and it appears Royal Caribbean is trying to simplify that first day for guests with a new boarding day quick guide. 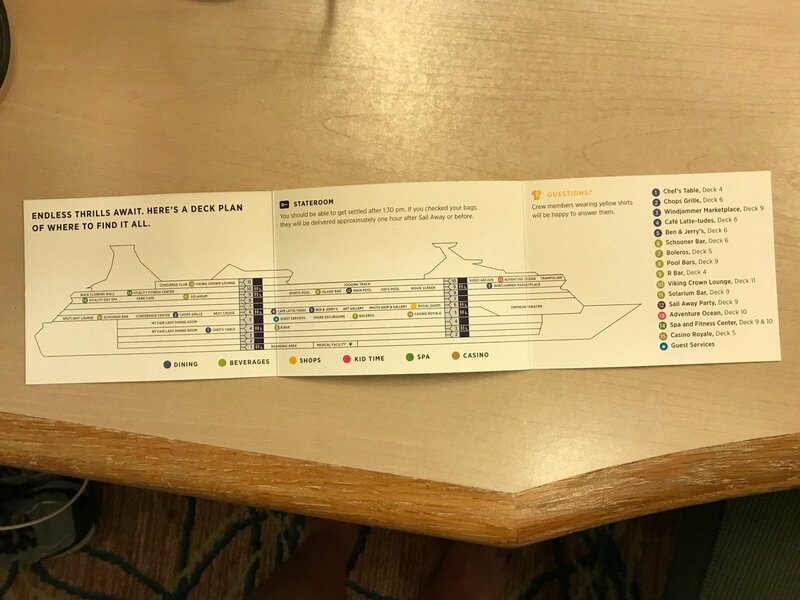 So far we have heard from Royal Caribbean Blog readers on a couple of ships that they have seen a new style boarding day quick guide. Mariner of the Seas quick guide. Photos by Twangster. 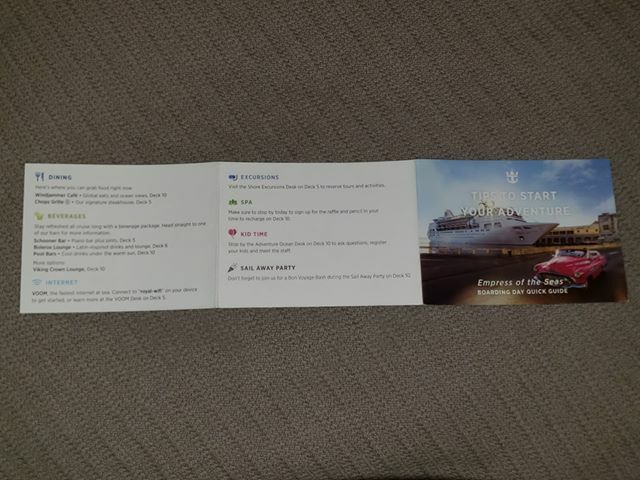 Enchantment of the Seas quick guide. Photos by Twangster. 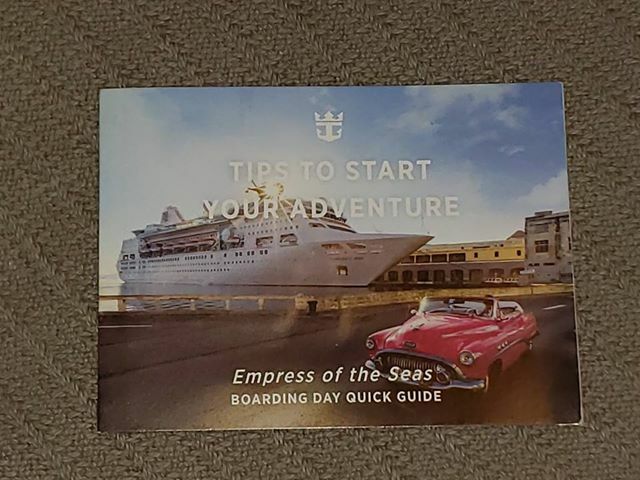 Empress of the Seas quick guide. Photos by Thomas Bissland. 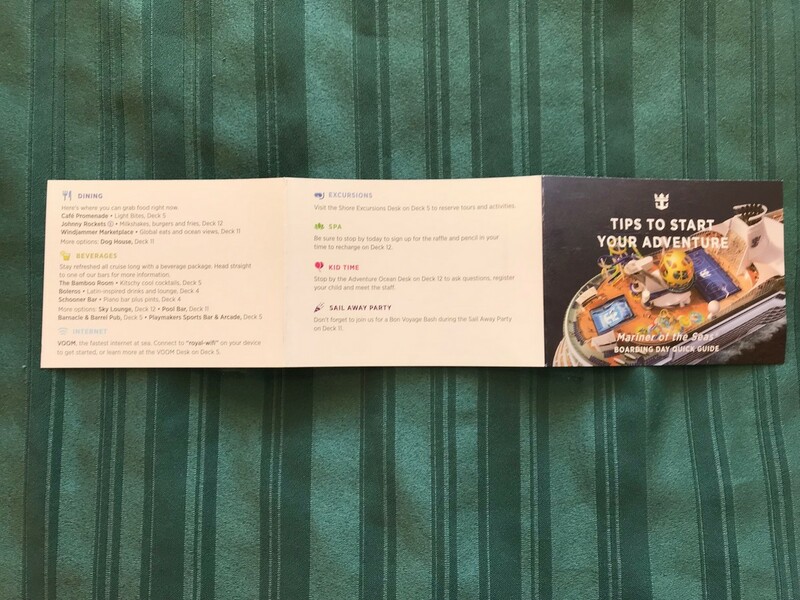 The new guide is a quick flip open pamphlet, as opposed to the old style boarding day guide which tended to be a single sheet of paper with important information listed. 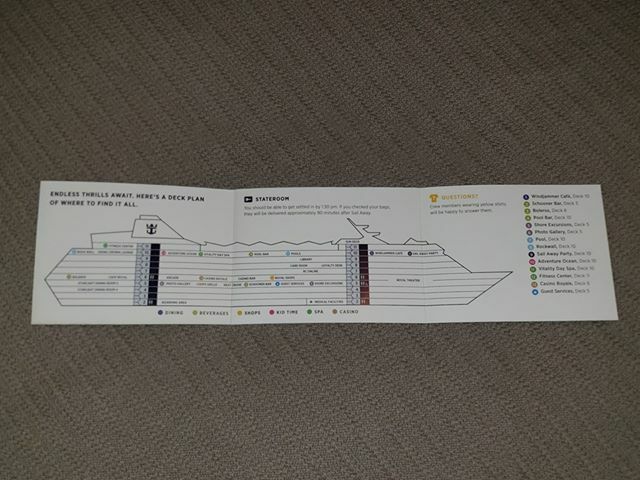 The new guide lists important places on the ship, provides a deck plan overview, and explains which restaurants and bars are open on embarkation day. 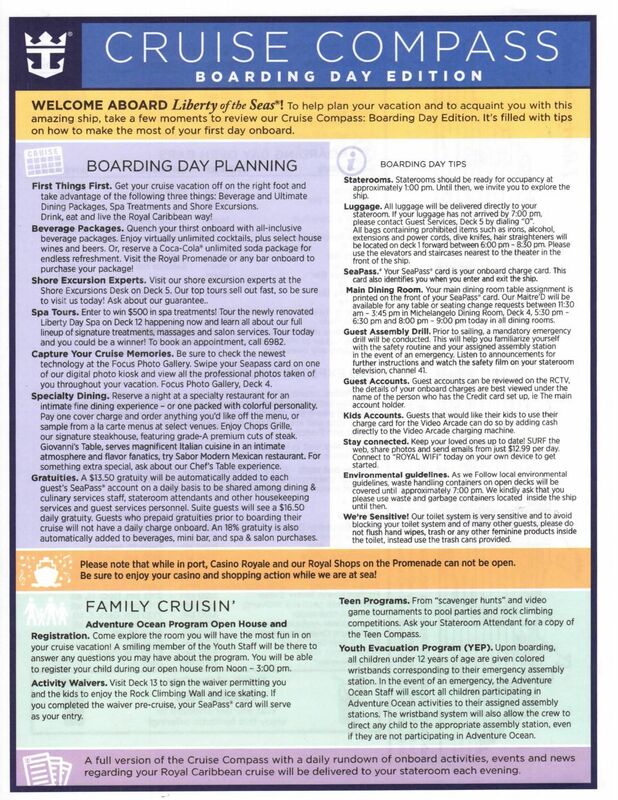 An example of the previous boarding day guide style. 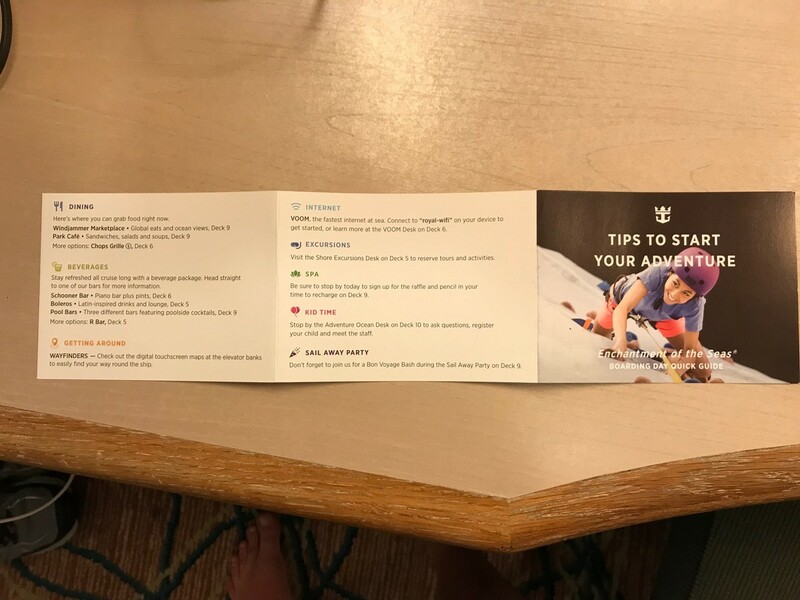 Do you like the new boarding day quick guide design? Share your thoughts in the comments. 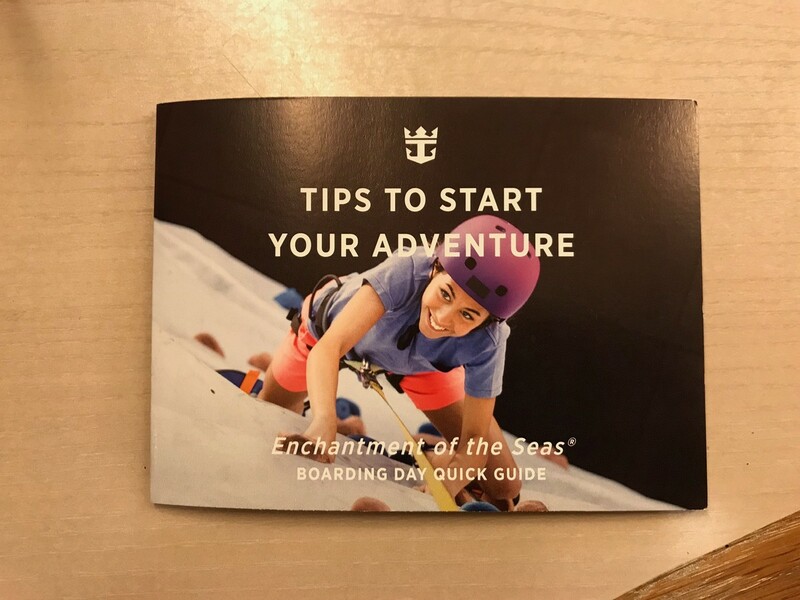 Royal Caribbean is inviting select guests to try out a new way to board the ship that aims to improve the embarkation process. 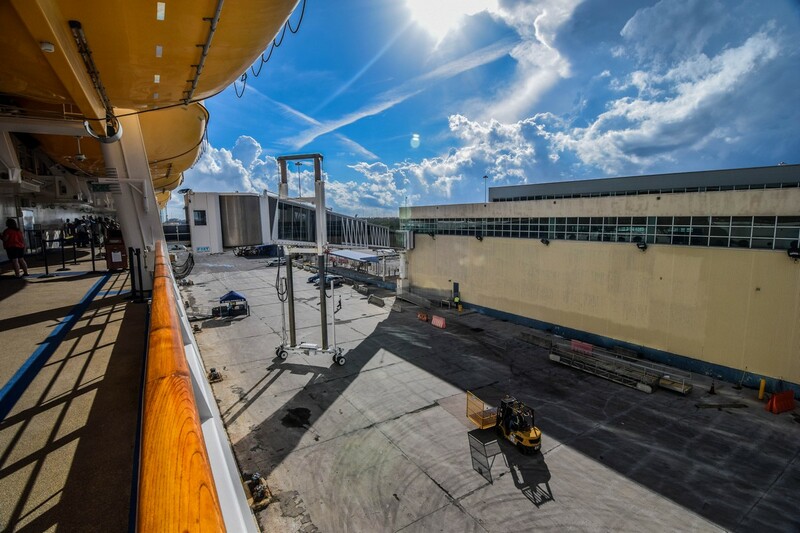 Royal Caribbean Blog reader, Steve, shared with us an email sent with the invitation to try the expedited check-in for an upcoming sailing on Allure of the Seas. 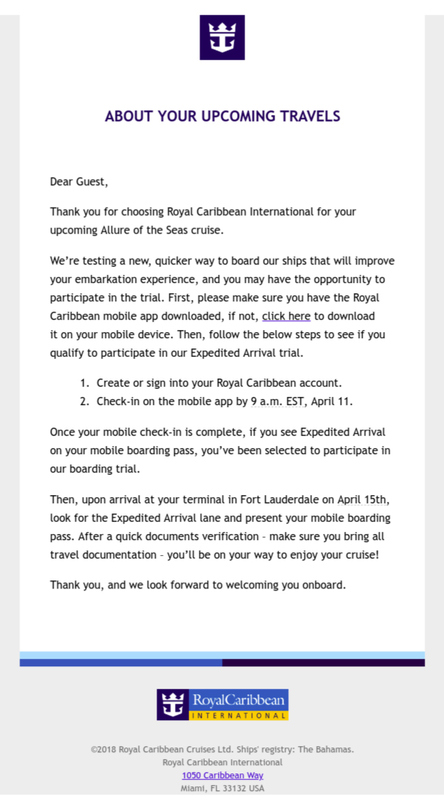 Guests simply need to download the new Royal Caribbean smart phone app and then check-in on the mobile app prior to the cruise. Once the mobile check-in is complete, guests might see an Expedited Arrival choice on their mobile boarding pass, which means they have been selected to participate in our boarding trial. Upon arrival at the cruise terminal, there will be an Expedited Arrival lane for these guests, who may present their mobile boarding pass. Since this is a test, the exact process may change. This may be a precursor to the "frictionless" check-in Royal Caribbean announced late last year. The excitement of your first day on a Royal Caribbean cruise is unparalleled in magnitude. Your entire vacation is in front of you, and the fun is only beginning. Once you are step foot onboard your ship, there is plenty to see and do, but you want to take advantage of these first few hours onboard to ensure you have the best possible cruise. Here is our list of things to do once you are onboard your Royal Caribbean cruise. Most cruisers get a bite to eat once onboard the ship, primarily because it is right around lunch time and with all the activity getting to this point, plenty of energy has been expended. Plus, lunch on embarkation day is one of those moments you can sit back and take in the gravity of excitement that you are really onboard. There will be a few spots onboard to eat lunch. The Windjammer is the most popular of these choices, given the wide variety of food available. There are also other good choices that may not offer as much food as the Windjammer, but do lack the crowds that tend to affect the Windjammer. Depending on which ship you are on, there can be some good alternatives that get you fed and on your way. Sorrento's, Cafe Promenade and Park Cafe are a couple of favorites. If you want to dine at one of the specialty restaurants onboard and opted to wait to book these restaurants onboard, you will want to make reservations sooner than later. Embarkation day is a great time to lock in a day and time to ensure there is space for you. As the cruise progresses, tables for specialty dining get booked up quickly, especially as new cruisers discover these terrific choices. Formal night reservations are usually the first to sell out, with sea days and the rest filling up quickly. You could risk trying to walk up and get a table later on in the cruise, but a reservation assures you of a spot for you. Reservations can be made for any specialty restaurant by going to Guest Services or by going to any specialty restaurant. If your ship has Royal iQ, you can make reservations directly in the app. Additionally, there is a dining reservation hotline you can dial from your stateroom phone. Finally, reservations can also be made for guests by Diamond Lounge and Concierge Lounge attendants. Whether you have a dietary restriction or just a special request with your meals, you will want to go to the main dining room and speak to the head waiter on duty about making dietary requests. There is usually a few hours on embarkation day where a head waiter is on duty to take requests. These requests can be for a table or dining rotation change, dietary request or anything else special you want to make certain is taken care of. This is also a good time to scope out which table you have been assigned to and if there are any issues with the table location or size of the table, speak to the waiter then. If you have kids, you will definitely want to register them for Adventure Ocean or the Royal Babies and Tots Nursery on embarkation day. This process is pretty quick, and allows the children time to explore the Adventure Ocean facilities, while providing the staff all the pertinent information on your child. Registration times for Adventure Ocean will be posted in your Cruise Compass, as well as on the door to any Adventure Ocean room. Once inside, kids can check things out while parents fill out a quick form. Even if your kids are uncertain if they will go to Adventure Ocean, registering them is quick, and it makes for less time wasted later on in the cruise. 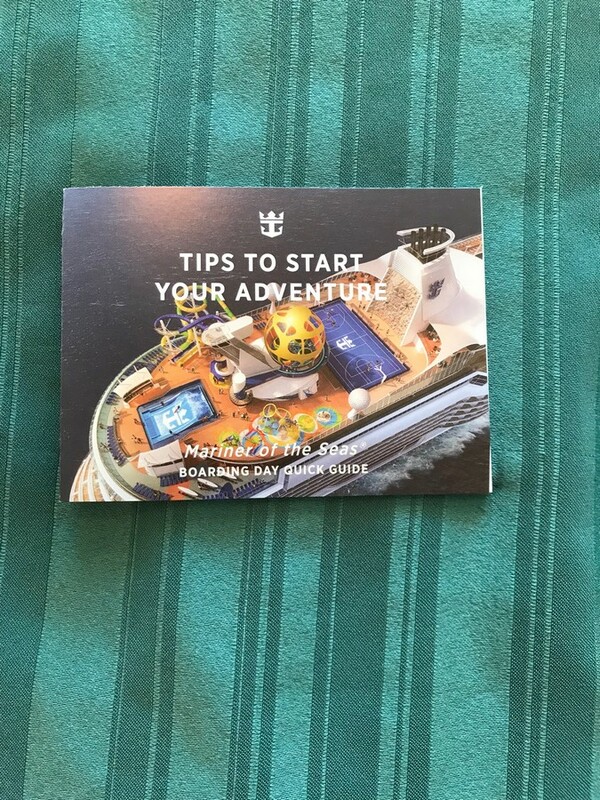 You may also find an Adventure Ocean table set up elsewhere on the ship to provide details about what Adventure Ocean is, and offer documentation on what kind of activities will be offered. If you child is less than 36 months old, she/he can be registered for the Nursery. The Nursery will also allow parents to reserve some time in advance, so be sure to review what to expect when booking nursery time. Be sure to take plenty of time to get to know your ship once onboard, and the best way to do that is by walking around it and exploring. While you can learn a lot from looking at deck plans, or reading Cruise Compass', nothing beats actually walking the ship. Getting acclimated with where everything will make your cruise easier since you will spend less time trying to locate everything. Plus you may discover something onboard you did not know existed! The Vitality Spa offers complimentary tours of the spa and fitness centers and while it is a sales pitch, it's fun to see the facilities available and something fun for the whole family to do. If you want to book a treatment for a particular day and time, you will want to make an appointment early before things start to book up. There's also a raffle that you can sign up for and perhaps win a free treatment. While you are touring the spa, the fitness center is in the same area, and this is the time to put your name down for a spot in any of the fitness classes offered. Royal Caribbean offers a good variety of fitness classes, with some complimentary and others having a small cost associated with them. If you have any desire to be included in a class, you will definitely want to sign up for them early. All too often guests wait too long to sign up, or try to walk in for a class only to find the limited spots are filled. There will be a table with sign up sheets near the entrance to the fitness center where you can sign up. There is no obligation, so you can sign up and only be charged if you make it to the class. Did you know the pools and hot tubs are open on embarkation day? Most guests do not even think about swimming when they first get onboard, and that is why it is one of the best times for a swim. By far the least crowded time at the pool will be embarkation day because most guests have their swimsuits in their luggage, which is in the process of being delivered to their staterooms. If you bring your swim suits with you (or wear them before you get onboard), then head to the pool and enjoy uncrowded pool time. Do not worry, there will be pool towels on the pool deck available to borrow there too. Odds are you are sailing to a foreign port of call and more than likely using your cell phone in those countries will cost you a lot of money in roaming charges. The best strategy is to use your phone to make calls or send text messages, and then place it into airplane mode to ensure you do not encounter roaming fees. Your phone will work normally while your Royal Caribbean ship is docked, and will even continue working a few hours after sailaway. Refer to our guide for using your cell phone while on a Royal Caribbean cruise to ensure you do not come home to unexpectedly large bills. Once your stateroom is ready (usually around 1pm), be sure to go inside and make sure everything is working and that everything that should be there is there. Test out the air conditioning, check to see if the crib you requested is present and that things like the television and toilet are functioning properly. Be also certain to test your in-room safe, as this is your dedicated spot to store valuables and you want to make sure this is working correctly and you know how to operate it. Take a few minutes to understand how to open and lock your safe, and make sure it functions as it should. If it does not, you will want to let Guest Services know as soon as possible. If anything is broken, put in a request with maintenance (via your stateroom telephone) now while the ship has extra maintenance crew members onboard. The crew member you will likely interact with the most is your stateroom attendant. She/he will be responsible for ensuring your room is stocked with plenty of towels, buckets of ice, as well as cleaned and arranged twice per day. If you have special requests of the stateroom attendant, it is important to convey them early on so that they can be taken care of quickly. Your stateroom attendant can handle things like ensuring there is always a bucket of ice in the room or bring you extra towels and blankets. Often the stateroom attendant will be around meeting you and the other guests in their loop of rooms they are are responsible for, so feel free to introduce yourself. Whether you choose to unpack everything or live out of a suitcase, it is a good strategy to put some of the things in your room away so there is less clutter all around. This has less to do with keeping your room clean, rather, it is about keeping things organized. There is always something going on during your Royal Caribbean cruise, and knowing where the important things are makes your life easier. Plus, it seems like there is always some down time before the muster drill, so take the opportunity to unpack your toiletries, put nicer clothes on hangers and store luggage under your bed. You will be happy when you return to your room after an evening of dining, drinks and fun to not have to start putting away all of your stuff. A very common choice is the sailaway party, which is usually held at the pool deck. There will be music, dancing and a whole lot of celebrating with the ship's activities staff. If you want something quieter, consider finding a spot near a railing that overlooks the port area. A hidden spot available on many ships is the helipad, which offers a fabulous vantage point. This is the one tip that is more about not doing something than remembering to do something, and that is to avoid the Guest Services line if at all possible. Unfortunately, the line for Guest Services is always longest on embarkation day, because many guests have first-time cruise questions and end up there to get them resolved. If possible, wait to speak to someone at Guest Services until the next day or during dinner hours. In our experience, most issues can wait until later, and unless it is something that needs immediate attention and/or cannot be remedied by your stateroom attendant, you should avoid the long Guest Services lines on embarkation day. Last, but not least, take some time to relax and savor the moment. 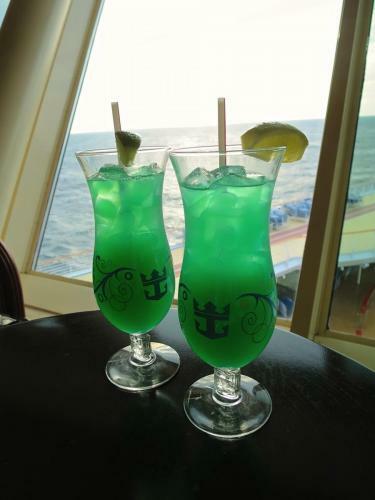 You are officially on vacation, so grab a drink at a bar and toast the start to what should be a fantastic time at sea. This may not sound like a big deal but getting things started off on the right foot is always a good idea and sets the tone for the rest of your vacation. The first day of your Royal Caribbean cruise is a really fun moment in any cruise fan's vacation, because it is when vacation begins and the many days, months and even years leading up to this cruise are finally realized. Embarkation day offers a lot to see and do, and for anyone going on a Royal Caribbean cruise, here is what you can expect on embarkation day. In most cases, your Royal Caribbean ship will arrive in port in the early hours of the morning and begin letting its just completed cruise passengers off shortly thereafter. The check-in process on embarkation day will take place throughout much of the day, and guests can arrive at their convenience to the port, as soon as the port allows guests to do so. In our experience, guests will usually be let into the cruise terminal around 10am, or shortly thereafter and embarkation usually begins somewhere around 11am. The exact times depend on a variety of factors, including how quickly customs clears the ship and how quickly Royal Caribbean's crew is ready for the new wave of guests. You should plan on arriving to the cruise port as early as you can so that you can start your vacation. The sooner you arrive, the sooner you can board the ship. It seems like a majority of guests tend to arrive in the afternoon hours, so arriving before 1pm can often result in shorter lines. The check-in procedure at the port consists of dropping off your luggage with porters, going through security and then meeting with the pier staff to receive your boarding documents. It is important to have your SetSail pass printed out prior to arriving at the pier to ensure a smooth and quick check-in process. You can find your SetSail pass at Royal Caribbean's web site under My Cruises. Royal Caribbean often boards guests in groups based on the order they arrive, although some guests do receive priority boarding (such as suite guests). In most cases, guests receive their SeaPass card, wait to be called to board and then board the ship. On Quantum class ships, your SeaPass cards are waiting in your stateroom. Once onboard a Royal Caribbean ship, there will be lots to see and do and like any cruise, it is up to you what to do. At check-in, you should have access to a special embarkation day Cruise Compass that lists venues that are open and activities that will be available. Most guests opt to have lunch somewhere on the ship on embarkation day. The Windjammer is the most popular choice, although ships may have other venues open as well. This is a great time to explore the ship and get your bearings onboard and see what is offered. Getting acclimated with where everything will make your cruise easier since you will spend less time trying to locate everything. Plus you may discover something onboard you didn't know existed! By 1pm, your stateroom will be ready and that means you can check out your new home, drop off any carry on luggage you brought and start enjoying the benefits of your room. Depending on your ship's departure time, a mandatory muster drill will take place where guests are instructed what to do in case of an emergency at sea. The crew will instruct you where and when to report for muster drill and it is a fairly straight-forward event. The muster drill consists of going to your assigned muster station and being instructed on what would happen in the event of an emergency at sea. There is no need to bring a life jacket to the muster drill. While the muster drill is not the most exciting thing about your cruise, following your muster drill, the real fun begins of a Royal Caribbean cruise. Sail away usually follows the muster drill, in which case there is a sail away party at the pool deck that many guests opt to join in. While many guests elect to join in the sail away party fun, others enjoy sail away from other parts of the ship, such as their balconies, on public decks or at the helipad on some ships. Following the muster drill and sail away, your evening plans will start to open up more than what was available during the afternoon. Once the ship leaves port and gets into open water, shops, the casino and more bars will open up. Specialty restaurants, the main dining room and other dining venues will also start serving dinner. Evening entertainment starts up around this time, with live music at a number of locations throughout the ship. The pattern of activities in the evening on embarkation day is a lot like what happens on any other evening of your cruise. What are your favorite things to do on embarkation day? Share them in our comments!